Only one week in, and already I’m going off script! But there’s a method to my madness. Fans of the Flat-Footed Fox will know that I have followed the Hanson’s Marathon Method for all but my first marathon. I trust it. I know it works. Whichever program you choose, you need to have faith in it too. Make sure you seek advice from knowledgeable sources, and follow the program TO THE LETTER. Having said that, the Hanson’s 18-week beginners program spends the first five weeks building you up to a 20-mile-a-week base. 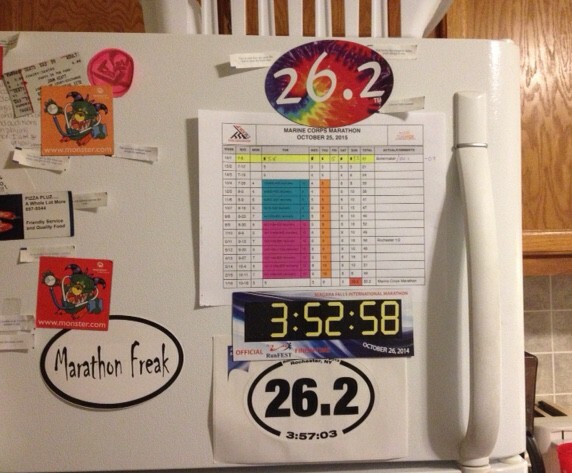 As I entered the program at that level, and as I was planning on running The Boilermaker at the end of this first week, I tailored my early workouts to that goal–rather than running 4 or 5 short runs a week, I opted to run my 20 miles in bigger, harder chunks, which I talk about in my Boilermaker 2015 blog. For now, though, I have comfortably met my mileage for the week. Hopefully, you’ve made it through the first week and met your goal, too. Second verse, same as the first as the song goes. Only this week, we can meet that mileage goal with some gentler runs. The program right now is all about that base (no trouble). This is my contract with myself, if you will. It is a prominent visual reminder of what I have to accomplish every day and every week. Because it is on my fridge, I cannot ignore it. I pass it several times a day, and when I leave for work in the morning, I am under no illusion as to what I have to do when I get home at night. It keeps me focused and disciplined, and when I check off each completed week with a highlighter, I either feel a sense of accomplishment if I have followed the program exactly or I get a much-needed reality check if I haven’t. We haven’t made any headway in reaching the $1,500 goal, but it’s early yet, However, you can be the first to make a contribution by going to my fundraising page. How’s your real or virtual training going? Did you go off with the gun, or are you still at the back of the pack waiting to get to the starting line? Leave a comment here, and I’ll feature it in the next Semper Currens. This entry was posted in Semper Currens, The Flat-Footed Fox and tagged Hanson's Marathon Training, marathon training, Marine Corps Marathon, Michael J. Fox Foundation, Team Fox, Utica Boilermaker, virtual running, virtual training. Bookmark the permalink.